Legislative leaders have revised the wording on two proposed constitutional amendments after a three-judge panel ruled that unless the wording was changed or an appeal reversed their decision the two would not appear on the November 6th ballot. The House convened Friday morning to consider the new wording and passed, by the necessary 3/5 margin, both amendments in early afternoon. The Senate is scheduled to come to Raleigh Monday and is also expected to pass the revised wording. Following ratification of the bill it will be returned to the three-judge panel to determine if both revisions satisfy the concerns of these judges. This revision removed language could have allowed the legislature to appoint members to many more boards and commissions. Many observers expect this new language to pass approval of the judges. While the legislature did removed the wording that many feared would allow lawmakers take away the governor's veto power but still essentially allows the legislature to make the decision on the filling of judicial vacancies. 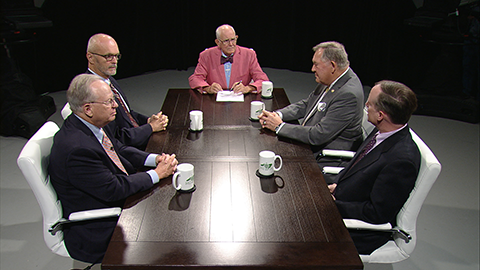 NC SPIN panelists Bob Orr (former Supreme Court Justice) and Rufus Edmisten (former Attorney General) said that they weren't sure this new wording would convince the 5 former Governors and 6 former Chief Justices of the Supreme Court to change their opposition to this amendment. NC SPIN panelist Becki Gray was at the legislature today and provided background information for this blog.